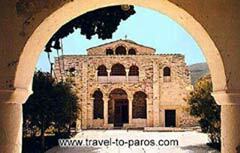 Ekatontapiliani (Our lady of the hundred doors) is the holy place of Paros which is linked to the history and myths of Byzantium. Tradition and history state that the church began life in the reign of Constantine the Great (280 - 337 A.D.) or Justinian (527 - 565). After its restoration in 1959, this church, the brightest jewel in the crown of Orthodoxy in teh Aegean, became the third most important Christian building in Greece, after the Panayia Akheiropoietos and St. Demetrios in Thessaloniki.